This review covers NonyX, a product made by Xenna, which claims to clear out dark, hardened, yellow detritus under your nails. It works by breaking down the keratin debris which causes yellowed nails. It comes in a dropper, making it easy to apply to get your nails looking white and beautiful in a hurry. Continue reading to find out whether this is the product for you. NonyX works by using a keratin softener called ethanoic acid as its main ingredient. Ethanoic acid is made from fermented corn and wheat, and exfoliates the tough keratin, clearing away the yellowed color and making your nails white and healthy in a hurry. NonyX should be applied using the convenient dropper which is built in to the cover of the bottle. The treatment should be applied so that it should the entire nail, including the cuticle and the portion under the nail where it touches the skin. Another option that the makers suggest is to use the “band-aid method,”. This involves applying the formula to the affected areas and then using a Band-Aid to seal onto the nail. Users can still apply nail polish while using this treatment, but make sure to apply the formula before the nail polish, as otherwise it will not be able to penetrate the nail polish. Xenna recommends using NonyX daily until the affected nails regrow. Depending on how fast your nails grow, this could be anywhere from 3 to 12 months. This seems like a rather long treatment time, but ostensibly it is to ensure long-term results by preventing keratin debris from re-accumulating on the nail. Ethanoic acid is generally considered a safe substance that will not harm most users. It is safe for use on both children and adults, but care should be take that it does not come into contact with the eyes as it is a known irritant. Additionally, some users have also reported experiencing irritation and redness in the area around the nail as a result of using NonyX. In this case it is recommended to discontinue use immediately. 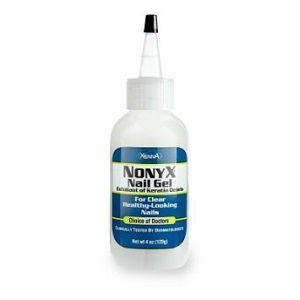 NonyX can be easily found in the foot care aisle of many domestic vendors, including Walmart and Rite Aid, as well as on-line at Drugs.com for an average price of $18.99. Xenna also offers their nail gel from their own site for $24.95 for a 4 oz bottle, and a $5.00 mail-in-rebate with first purchase. Should You Try NonyX Nail Fungus Treatment? NonyX seems to be a reliable and relatively affordable way to rid yourself of irritating and unattractive nail debris. It is also relatively non-toxic, which makes it safe to use even for children and diabetics. However, one drawback that we noticed is that the estimated recovery time for this product is long, at anywhere between 3-12 months. Another issue that caught our eye is that it is not specified whether it works to treat nail fungus, or simply to improve the outward appearance of your nail. While reviewing customer feedback on this product, there seemed to be a great deal of disagreement as to whether NonyX will get rid of nail fungus or not. This omission by the manufacturer could potentially lead to great frustration, as someone who spends 3+ months attempting to treat a fungal infection with a product that is not actually formulated to do so would be understandably upset. Sadly, this product did not make it to our Top 5 Products list. Jack Stevens	reviewed NonyX	on August 18th	 and gave it a rating of 3.